The Oakland Athletics reached deep into their bag of tricks in their attempt to win the series opener at Fenway. In the seventh they called upon switch pitcher Pat Venditte to keep Oakland in the game and he pitched two excellent innings, allowing just one hit, walking none, and striking out Blake Swihart. A pitcher must indicate visually to the umpire-in-chief, the batter and any runners the hand with which he intends to pitch, which may be done by wearing his glove on the other hand while touching the pitcher's plate. The pitcher is not permitted to pitch with the other hand until the batter is retired, the batter becomes a runner, the inning ends, the batter is substituted for by a pinch-hitter or the pitcher incurs an injury. In the event a pitcher switches pitching hands during an at-bat because he has suffered an injury, the pitcher may not, for the remainder of the game, pitch with the hand from which he has switched. The pitcher shall not be given the opportunity to throw any preparatory pitches after switching pitching hands. Any change of pitching hands must be indicated clearly to the umpire-in-chief. 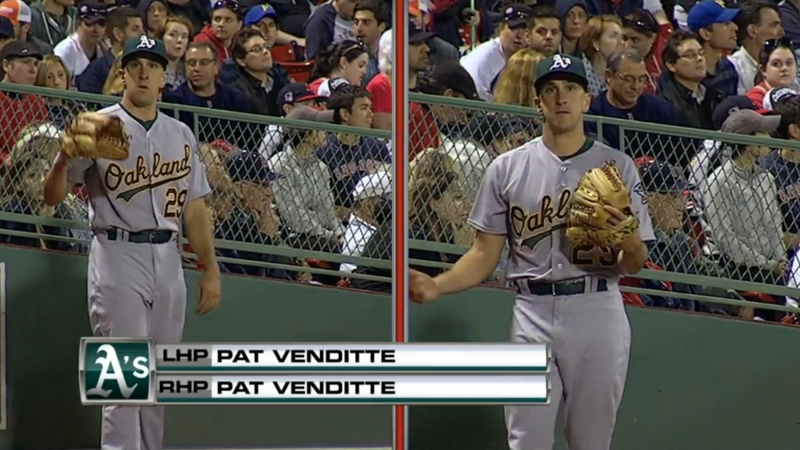 While the Red Sox didn’t score against Venditte they had enough of a lead to win the game. Oakland‘s second baseman tried to decrease the margin in the eighth by any means necessary. That included feigning being hit by a pitch on the right hand when it hit the knob of the bat. In Sogard’s recoil from the extreme pain of the assault he shook the wrong hand. 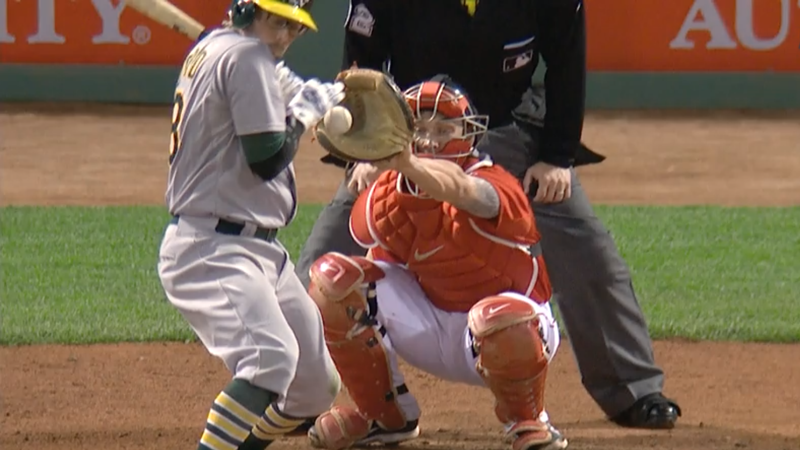 The umpires reviewed the play and upheld the call that Sogard was hit by Wade Miley’s pitch. Playing against Oakland was like watching a mirror image of the Red Sox. Both have talented players that have not united into a cohesive team. The Athletics defensive imperfections, like Josh Reddick’s missed catch of Dustin Pedroia’s liner in the fifth, were reminiscent of Pablo Sandoval and Hanley Ramirez’s recent woes. The Red Sox picked up Alejandro De Aza to spell Ramirez in left. What will it take for the Oakland to click?